The late SEAL Team 3 Chief Chris Kyle (1974-2013) served four combat tours in Operation Iraqi Freedom and elsewhere. For his bravery in battle, he was awarded two Silver Stars, five Bronze Stars with Valor, two Navy and Marine Corps Achievement Medals, and one Navy and Marine Corps Commendation. Additionally, he received the Grateful Nation Award, given by the Jewish Institute for National Security Affairs. 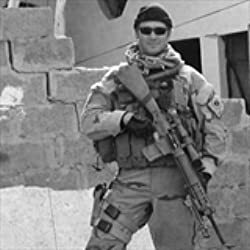 Following his combat deployments, he became chief instructor for training Naval Special Warfare Sniper and Counter-Sniper teams, and he authored the Naval Special Warfare Sniper Doctrine, the first Navy SEAL sniper manual. Chief Kyle is survived by his wife and their two children. Please enter your email address and click the Follow button to follow Chris Kyle!